In reply to another question, President Assad blasted some sides in the foreign backed oppositions as dancing to the music of those who pay more of dollars, once paid a one-dollar banknote would give a certain voice, and once paid a 10 dollar banknote would give multi voices with different tunes. "France spearheaded supporting terrorism in Syria and is involved in shedding the Syrian blood, and we see no drastic change in the position of France; so the French are not in a position to evaluate a supposed to be peace conference and those who support terrorism have no right to talk about peace. Not to mention the fact that they basically have no right to interfere in the Syrian affair. All of the statements by the French are for us nothingness and out of our interest," in reply to a question said H.E. President Assad. H.E. President Assad asserted that Syria, the founding member of the United Nations, welcomes a UN role in Syria, based on the sovereignty of Syria and on what the Syrian People would decide, asserting that any UN role breaching on the Syrian sovereignty is rejected. 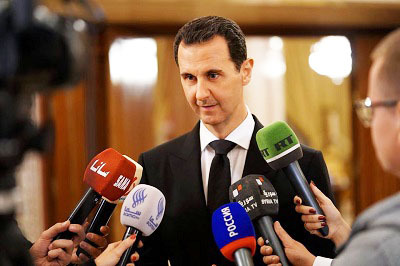 President Assad pointed out that Sochi Conference is to discuss the Syrian Constitution, whether the current Constitution is suitable, whether it needs amendments, whether Syria needs a new constitution, asserting that once a constitutional amendment to occur, elections based on it are to be held. President Assad outlined that the basic difference between Geneva conference and Sochi conference, which we are working on with Russian friends, is based on the quality of the participants or the participating sides, while the persons with whom we are negotiation, as it is well known, do not express the Syrian People, do not even express themselves in some cases. In reply to another question, H.E. President Assad noted that the standing Syrian-Russian relations stand for more 6 decades with focus on the political aspect, and the military aspect given the ongoing war on terrorism, and the focus on the economic aspect is now on given the improvements in the security situation and the Syrian Economy moves. H.E. President Assad described the Russian delegation current visit as an opportunity as to activate the standing projects of Russian investments in Syria. President Assad underscored that the continued victories against terrorism in Syria create the appropriate conditions as to accelerate the rebuilding process of what terrorism has destroyed in many places of the regions in Syria, opening wide economic prospects and opportunities for further cooperation between Syria and Russia. President Assad added that Russia is naturally an important partner for Syria in rebuilding in all sectors, given the standing historic relations and the honorable stances of Russia in confronting the war of terrorism against Syria. On his part, Mr. Dmitry Rogozin, voiced ever willingness by the government of Russia and big Russian Companies to provide every support and experience in active contribution to the rebuilding process in Syria and in support of the Syrians aspirations to progress and prosperity and in the mutual interest of the friendly people of Russia and Syria. H.E. 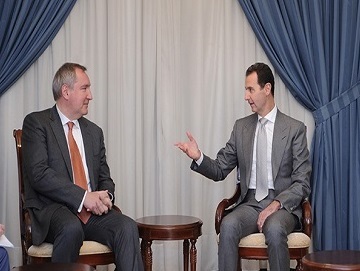 President Bashar Al-Assad received on November 22, 2016, a Russian delegation, chaired by Dmitry Rogozin, the Deputy Premier of the Russian Federation. The visiting Russian delegation comprises the deputy ministers of Foreign Affairs, Defense, Economic Development, Energy and Agriculture. Talks during the meeting dealt with the close bilateral historic relations between Syria and Russia in light of the standing coordination in the field of fighting terrorism and the economic and trade fields. The stances and policies taken by Russia at the international level and as regards the war of terrorism against Syria have indeed proved the natural position of Russia as a great power based on principles, values , commitment to international law and the respect for states' sovereignty and right to self-determination. President Assad cited the importance of the Russian support for Syria in all fields, particularly in the economic field which concretely contributed to reduce the Syrians' sufferings, caused by the war of terrorism and the for years unjust imposed economic sanction. Mr. Rogozin underscored that the main goal for the political, economic and military assistance provided by the Russian Federation to Syria, government and people, is but to bolster the steadfastness factors against terrorism, which perpetrates heinous crimes against Syrians where the dangers of such terrorism extended to many worldwide spots.